The comedy Saxophon-Susi (1928) was screened with live piano accompaniment by David Schwarz on January 8, 2019, at the Zeughauskino in Berlin as part of the series "Weimar International: Silent Film without Borders". Both Anny Ondra, the star of the picture, and Carl Lamac, the film's director as well as Ondra's then-husband, had their start in the Czech film industry before branching out internationally. The film, which was digitally scanned from the nitrate print held at the Národní Film Achive in Prague, had a running time of approximately 52 minutes, since "most" of the first two acts (of six total) are missing from this surviving print. Even without that footage, however, the story was easy to follow (largely due to its predictability). The film survives with Italian titles, which were supplemented with German translations projected on the screen as subtitles. The story concerns two befriended young women who attempt a bit of deception. 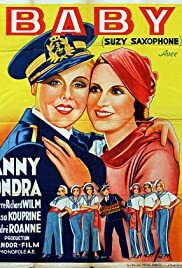 Annie (Anny Ondra) is a dance-crazy flapper and theater enthusiast from a well-to-do noble family who decides she needs to be sent to a finishing school for girls in England in order to put such notions out of her head. Her friend Susi, who is more interested in books than the stage, is the daughter of working-class parents at a revue theater and is also about to be sent to London to be trained as a chorus girl. While crossing the Channel to England, Annie spontaneously introduces herself to a potential beau as Susi and so the plan begins: the two will switch identities, with Annie taking Susi's place at the dance school, and Susi posing as Annie at the boarding school. After this point, the story focuses only on "Susi's" fate, which as you can guess from the film's title, has everything to do with partying, Jazz, and dancing. The inevitable complications ensue as Susi and her beau (an English Lord!) navigate their relationship, but there is no doubt that everything will end happily. Anny Ondra is very appealing and reminds me a bit of Marion Davies here, since she does a lot of physical comedy. The other actors (among whom is Hans Albers in supporting role) also are suited to their parts. The film is enjoyable fluff, which of course is all it was intended to be.